House Buying Tips - What to Look For Before You Buy. If you’re expecting to find some house buying tips that help you buy a house for almost nothing, fix it up and flip it, you’re at the wrong spot. I will tell you some things to watch for if you are considering buying a fixer-upper, though. Rule number one is do not make any assumptions. A case in point would be the little place Bev and I bought in Glenns Ferry (ID) back in the late 80’s. This was a small house on a 75’ lot in the middle of town. Being in town it has to have water and sewer services, right? Wrong! After we bought it, we found out that it was still on an old septic system and had to be hooked up to the city sewer system or be condemned. There went a thousand bucks we didn’t have, and I did all of the work. That was just the hook-up fee to the city. Of course, if I sell it as a vacant lot (the house is now being torn down), the value is increased because it does have water and sewer, now. Being a very small system, our water right is only for 40 households, and all 40 memberships in the Association are taken. 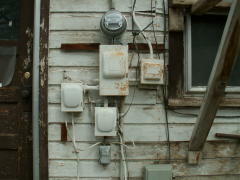 There are three that don’t have service, yet, but are reserved for future expansion by the property owners. Recently, an old, vacant home was sold and the new owners promptly started cleaning and fixing up. Of course, there came a time when they wanted the water turned on and I had to say “Sorry”. When our system was upgraded in the mid 90’s, the owner of that property opted not to have service hooked up and gave up their membership in the Association, so of course, there is no service now. The new owners have a couple of choices. They can try to buy a membership from one of the three owners that are looking for future expansion. Or, they can work with the Association to see if there is the capacity within the existing system to handle another household. This might require an engineering study. Then there is the problem of increasing the water right. There is no guarantee that the Water Resources Department will grant us an expanded right, even after we show the need and the capability to expand. And, no, they can’t drill a well, because they don’t have enough land to support a well and a septic. Central District Health requires a minimum of one acre for both a well and septic system. If there is a community water system, then you can have a septic on less than an acre, as long as you can meet the other setbacks. Needless to say, there is no central waste disposal (sewer) system here; we are all on septic systems. A third case has to do with the irrigation system here. I’m retired from the King Hill Irrigation District and there were several times when folks would buy a piece of property and then be astounded to find out that there were 2 or 3 years of back water bills owed on their property and that they had to pay up or face losing the property. Here in Idaho, the water (and the bills) go with the land, not the owner. If a title search company isn’t on the ball, something like this can be missed. Always contact all service providers (electric, gas, water, sewer, garbage, etc) yourself to make sure there are no surprises lurking in the shadows. As I said, rule number 1 (and probably thru 10) is don’t make any assumptions when looking at a home to buy. Once you are pretty sure that you really want to buy THIS house because it is such a good deal, you should access the services of an independent building inspector, as it will be money well spent. If you can’t find a qualified home inspector, then here are a few things that you need to watch for as you look over your future home. If you already own a home, or even if you’re still renting, sit down for an evening and write down every problem that you can remember that you’ve had with your home. This will give you a good idea of things to look for when you’re inspecting the new place. From the outside of the house, look at the roof, from all sides. 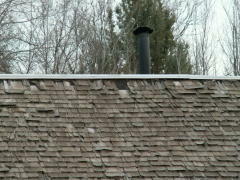 Watch for shingles that are missing or even turned up from the wind. Look at the paint and caulk on the windows and trim. If the caulk that holds the glass in glass is dry and cracked, there may be a problem and the windows will need maintenance or replaced. If the house does not have a basement, look around the foundation. Look for vents that are properly screened. Look for access to the crawl space. Is there even a crawl space? Look at any outside faucets and check for leakage. Find the main water shut-off valve for the house. Does it work? Look at the electrical box. Are all of the breakers labeled? 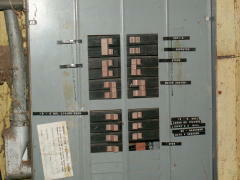 If the house has fuses and not breakers, this is an indication that the house may need rewired. If there is a basement, look at any exposed plumbing and wiring for obvious problems, leaks, loose wires, corrosion on pipes or wires. Is the hot water heater in the basement? Does it have isolation valves? Can it be drained through a floor drain, or will it have to be pumped outside? Inside the house, again look at the windows. Look for signs of excessive condensation problems. 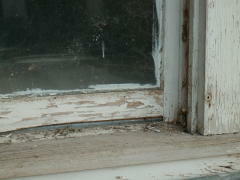 If there are water stains at the base of the windows, this indicates enough condensation to cause some run-off. 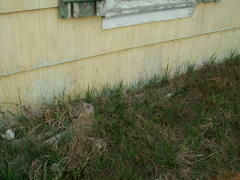 This can cause damage to the casements and framing. 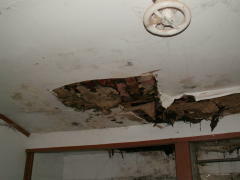 Look for signs of leakage in the ceiling. Water stains are hard to cover up with just paint, so old stains may still be visible, even if they were recently painted. Look at the electrical fixtures and switches: are the covers in good shape and do they match throughout the house? Mismatched covers don’t really indicate a problem with the wiring, but they do reflect the attitude of the owners. Check all of the sinks and faucets for leakage. Turn the water on and see how difficult it is to turn off. Stains or hard water build up in a sink can indicate old leakage, even if there isn’t any now. Is there a water softener, if so, find out about the maintenance and upkeep problems that might be associated with it. Is there an owners manual? Speaking of owner’s manuals, ask if they have them for all of the major appliances in the home. Find out how old everything is and if there have been any problems. Is there an owner’s manual for he house? Look inside the cabinets and drawers for signs of mice. Look for traps, droppings, holes in the walls, insulation on the bottom of the drawer cabinet (pull the bottom drawer and look inside). Look at the bottoms of the drawers for signs of excessive wear, parts coming un-glued, warped sides and bottoms. Make sure all of the doors open and close smoothly and latch properly, both in the cabinets and the rest of the house. Look at the thresholds under the doors for uneven wear, which would indicate worn hinges or maybe uneven settling of the foundation. Look for cracks in the walls and foundation. If there has been uneven settling, it will show up in the walls, in the joints of the sheetrock. Check to see if there is access to the attic and if the attic is insulated. Ask to see records of power bills, heating bills, water bills. Is there a fireplace or wood stove? What is the local source for firewood and how much does it cost? Are you going to maintain the yard or hire a local handyman. What is that going to cost? Find out if there is any record or history of Radon Radon problems in your area and if the house you're looking at has been tested for Radon. If there is a history of Radon in your area, be sure atest has been done BEFORE you buy! As you can see, there are a lot of areas that can cause problems. In fact, there is a whole house full of them. The best thing you have going for you is your own common sense. Do not rush in to a decision, just because the realtor says that there are several other buyers waiting to jump on this treasure. Do your research, sleep on it a couple of nights, talk to your friends, but don’t let them make the decision for you. This is your money and your future. You must keep control yourself.